Description: 28002 Goodridge G-Stop Stainless Braided Brake Lines for 05-10 Scion tC. Goodridge G-Stop Brake Line Kits are constructed from the finest quality hose, consisting of a PTFE inner and stainless steel over braid. 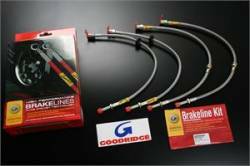 Description: 28001 Goodridge G-Stop Stainless Braided Brake Lines for 04-06 Scion xA / xB. Goodridge G-Stop Brake Line Kits are constructed from the finest quality hose, consisting of a PTFE inner and stainless steel over braid.